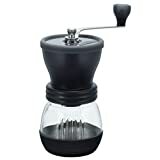 The Hario Skerton Hand Mill—also known as the “Skeleton” due to a translation error—is one of the most popular manual coffee grinders on the market, and for good reason. 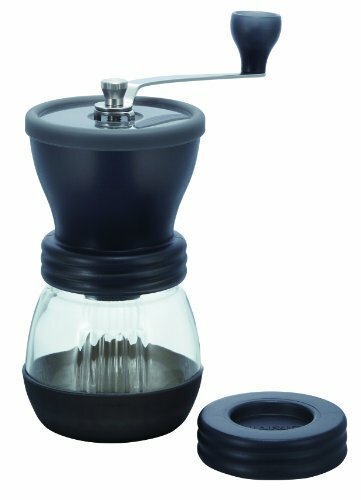 With an adjustable grind size that can make everything from espresso to a French Press-ready coarse grind, durable ceramic conical burrs that won’t rust or react to essential oils, and an ergonomic design that’s easier on your hands, the Skerton is a step up from models like Hario’s Mini Mill if you’re looking to grind larger batches of beans. In this Hario Skerton review, I’ll evaluate if it’s worth the effort to go with this hand grinder mill. Manual grinding does mean your morning brew will require more of a time commitment and physical effort, but in my experience, this extra work is well worth it for better-tasting coffee and more precise control over each cup. While I sometimes prefer the convenience of an electric grinder (especially those days when I’m already in a hurry), manual grinders turn coffee into a morning ritual, and the extra steps required to prepare a cup result in cleaner flavors and more consistent results. When evaluating a hand-grinder, my main criteria are the quality of the coffee grind, the machine’s ease of use and maintenance, and the construction of the grinder itself. While the Hario Skerton does have some issues (particularly with coarser grinds), I found that it exceeds expectations for a budget grinder and is well-built for daily use, especially if you’re looking to grind beans for espresso or drip coffee. The Hario Skerton Mill is an excellent grinder for someone looking for precise control over their grind at an entry-level price point. Retailing for under $50, the Skerton gives home baristas the same variety of options they might expect from a pricey automatic grinder coupled with the convenience of easy storage. Ceramic Burrs: The ceramic conical burrs are one of the Hario Skerton’s biggest selling points. They’ll never rust or leave your coffee with a metallic taste, and the fact that they don’t react to the essential oils in coffee means that each batch of grinds is going to taste fresh and flavorful. Portable: The Skerton fits easily into a bag or suitcase, and the grinder handle pops off for easy storage. If you’re worried about the glass receptacle breaking in transit, it’s also worth noting that the mill can also fit on standard mason jars, which are cheap and widely available, and can save you from having to travel with glass in your bag. Easy to Clean: The handle isn’t the only part of the Skerton that’s easy to detach. In fact, you can easily disassemble the entire mill for easy cleaning with a good quality grinder brush. The glass container is similarly easy to clean, and the simple design of the Skerton means there aren’t many places for old grounds and oils to build up. Your coffee will taste better if you avoid washing the mill with any type of detergent. Large Capacity: The Skerton is actually the larger of Hario’s hand mills, and has about twice the capacity of the company’s Mini Mill. While the Mini Mill has plenty to recommend it, the Skerton is ideal if you’re brewing more than two cups at a time or preparing several shots of espresso. Durable: The Skerton is made of high-quality materials including stainless steel, plastic, and glass (in addition to the already-mentioned ceramic burrs). Even under the strain of daily use, I’ve run into no issues with any of the parts breaking, warping, or cracking. Some customers have reported their Skerton mills arriving cracked burrs, however. Ergonomic Design: The Skerton’s hourglass shape fits comfortably in your hand, and the included silicon grip for the glass receptacle is a nice addition if you prefer to prop the mill against a counter for some extra leverage while you grind. I’ve found that I like to use the Skerton sitting down with the glass propped against my leg to add stability. For me, the Skerton’s combination of quality materials and large capacity make it my go-to manual grinder. I like being able to hand-grind a larger batch of beans if I have guests over, or if I just want to have a bigger pot of coffee. While it’s true that a larger batch of beans requires a few extra minutes of grinding time, I still think it’s a better solution than grinding several smaller batches with a model like the Mini Mill. Inconsistent Particle Size: For finer grinds, including drip brewing and espresso, I didn’t find this to be an issue, but moving toward coarser grinds resulted in a less consistent particle size. This can definitely be an issue to watch out for if you’re brewing with a French press or grinding coffee for a pour-over. Grind Adjustment: The mechanism to adjust the grind size on the Skerton can be unintuitive, requiring users to remove the mill’s handle, remove a lock nut, and adjust a small gear to the desired size. To me, this is the biggest drawback of the Skerton, since finding the same setting every time requires a lot of experimentation. Weight: While I don’t find the added weight from the glass receptacle to be too big of an issue, some users have reported that they find the Skerton to be a little on the heavy side. This may be a matter of personal preference, however, since I think that extra weight just results in a sturdier grinder that withstands heavy use. Because the Hario Skerton Mill is so widely used, there are a number of third-party solutions and user-created “hacks” to address the few drawbacks, including several DIY kits that add a second bearing to help with coarse grinding. If you find a grind setting that works particularly well, you can also find a way to mark the gear so you can easily reset the mill after you take it apart for cleaning. Other Hand Grinders: I’ve also rounded up my top hand mill recommendations here. The Hario is included, but there are others to consider depending on your needs. Turkish Mills: Looking for a good Turkish grinder? Check out our top options here. For its price, which is a fraction of what you might spend on a high-quality electric burr grinder, the Skerton is an excellent device and should be a top choice for serious home baristas. 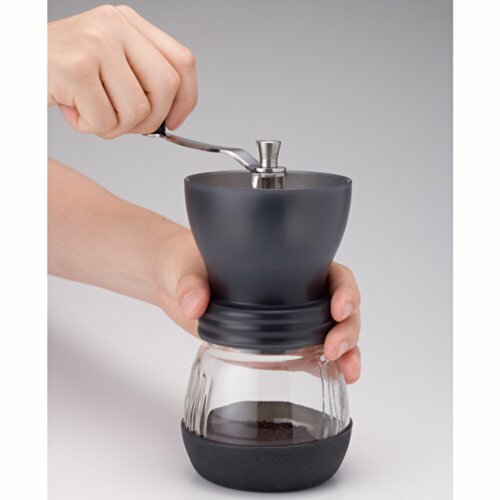 Hario has a reputation for high-quality glass and coffee products, including its V60 pour-over drippers, and that reputation is well-earned based on my experience with the Skerton. While you may ultimately want to go for a smaller model like the Mini Mill if you’re only looking to brew a cup at a time, the Skerton should be high on your list if you’re searching for a high-capacity manual grinder. Its drawbacks, which are very few, can be easily mitigated or worked around, and the quality of finer grinds right out of the box is outstanding. If you’re willing to put in the work to hand-grind your morning coffee and learn the Skerton’s quirks (most importantly, how to adjust the grind size), you’ll be rewarded with a fresh and flavorful cup of coffee whenever you use Hario’s best-known model.